In this third volume of her Unbroken Bonds series, Marrion (Liverpool Connection, 2014, etc.) 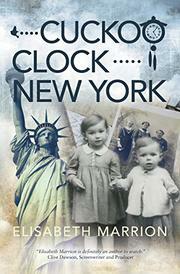 again uses fictionalized family history as a window onto major events surrounding World War II. A prologue set in 1998 has Elisabeth and David—versions of the author and her husband—finding a cuckoo clock in a Florida antiques shop. Noticing it was made in Hildesheim, Germany, where she was born, they muse: “Wouldn’t it be strange if the watchmaker and Elisabeth’s family had crossed paths at some time?” What follows is, presumably, a blend of documented history, family lore, and novelistic license. The narrative quickly zeroes in on Dr. Esther Rosenthal, daughter of the cuckoo clock’s creator, Mordechai Goldstein. The morning after Kristallnacht, they flee Germany, traveling via the Netherlands to England—where they promised Esther’s husband, Ibrahim, before he was taken away by the SA, that they would wait for him. By chance, they accompany some Jewish children on the voyage, seeing them safely to their English destination. Esther is now so fond of three siblings in the group that she adopts them. The two youngest sail with her and Mordechai to New York to deliver several children to Brooklyn relatives, allowing for a different take on the quintessential immigrant arrival. When Esther learns that her eldest son has been caught up in the bombing in Coventry, however, she rushes back to England to find him. There are perhaps too many locations and subplots in play here; streamlining the history could have made the novel more focused and less perplexing. But Marrion writes in snappy chapters. Switching between England, Germany, and America, she presents a broad range of wartime experiences. Best of all are the sections tracing Ibrahim’s struggles in Dachau, especially an ironic scene where he finds a cellmate dead as “Silent Night” drifts in from the officers’ quarters. Characters from the previous books make cameo appearances, creating a cleverly interlocking story. An intriguing, if sometimes confusing, sideways glance at historical elements, such as Kindertransport, immigration via Ellis Island, and the bombardment of England.